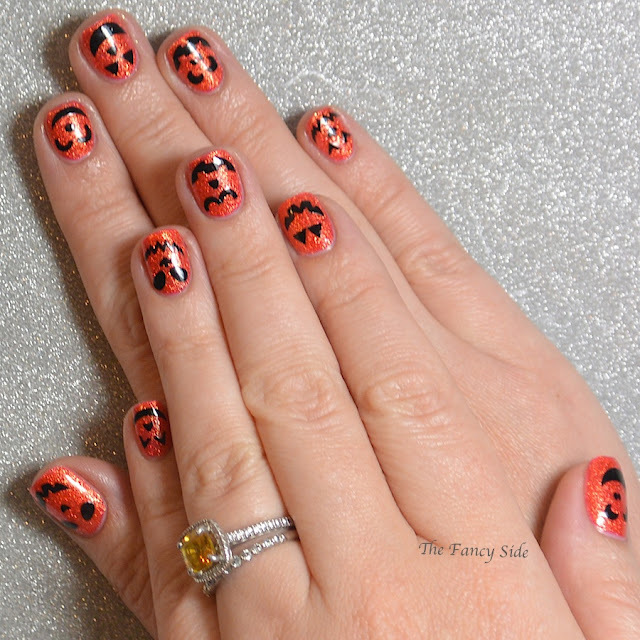 My final Halloween themed #StampingSaturday look. 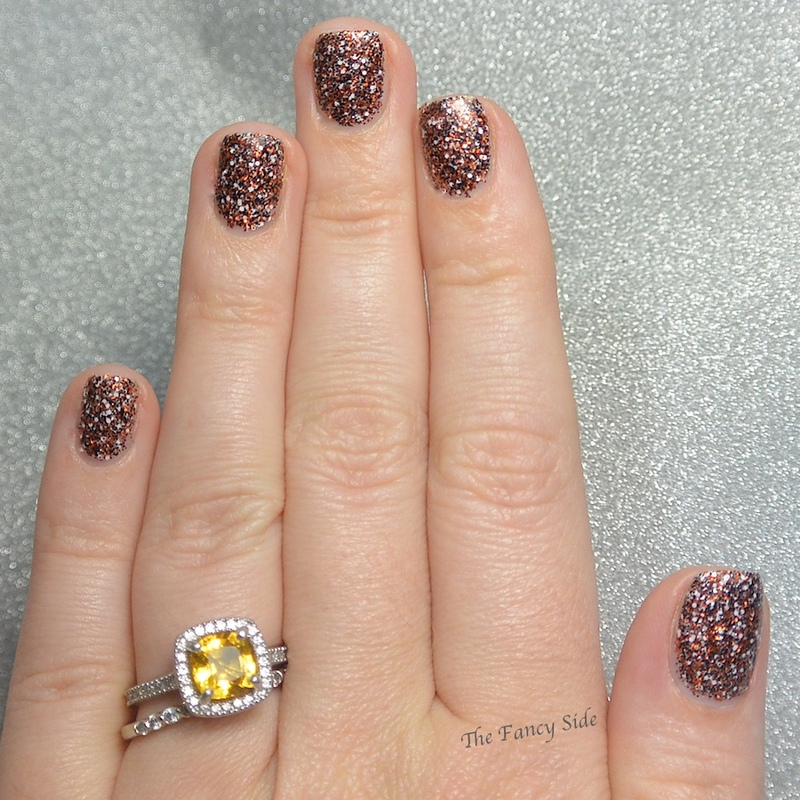 For this one I kept it simple so that the base polish, which is sooooo pretty, could shine. 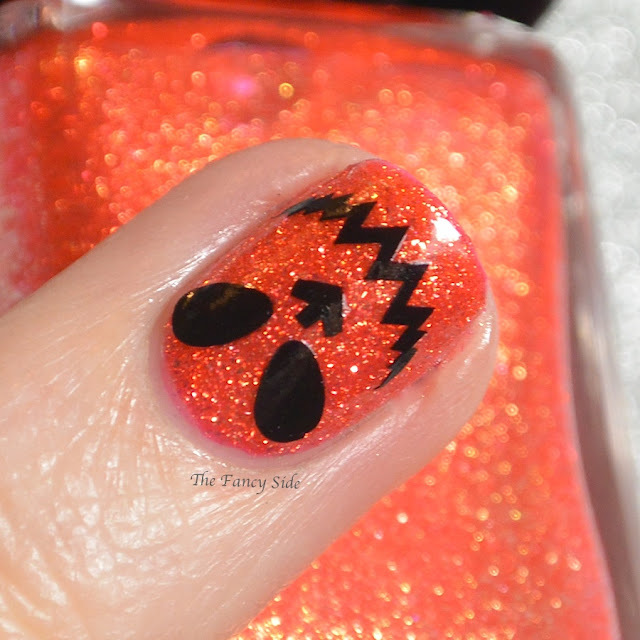 My base is Beyond the Nail Spooktacular*, a glitter bomb filled with orange, black, and white glitters. This was 2 coats for full coverage, brushed on. Talk about awesome! 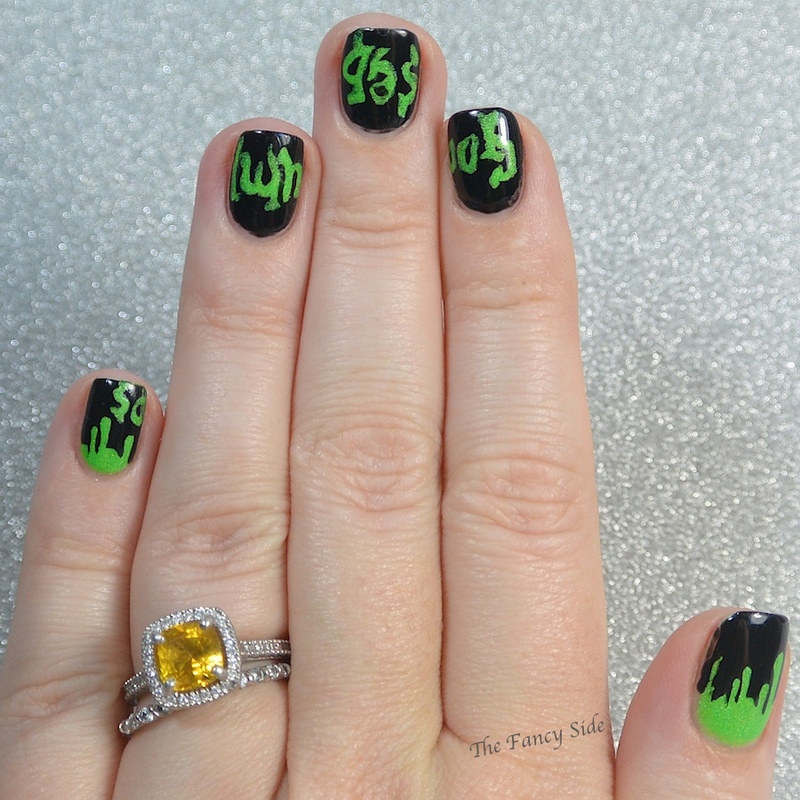 I then added two simple stamps from Uber Chic Halloween-01 with Sinful Colors Snow Me White. This plate has been a real champ for me all month. I love how versatile it was. 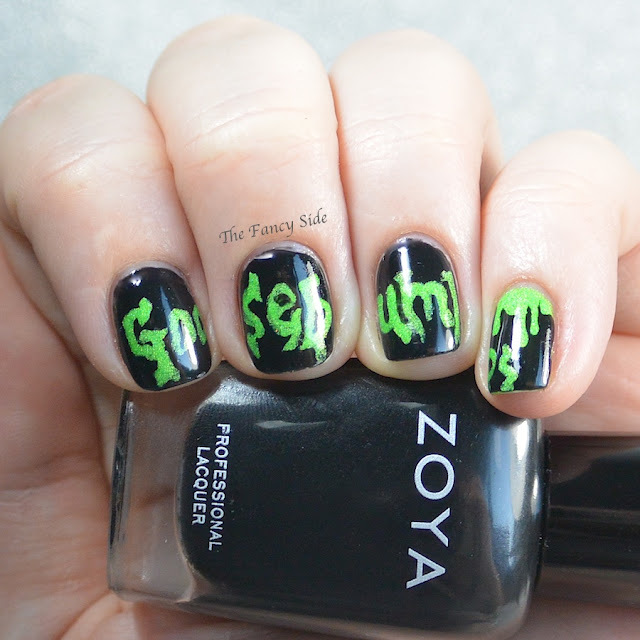 Be sure to check out more stamped looks below and join us every Saturday! I started with a base of LVX Anthracite, a deep gray creme. This beauty was easy to apply and covered in just two coats. Also, some of you may notice that I went back to the oval shape. Let the celebrations begin. They are short right now, because I'm still dealing with that break, but they are back in the much loved shape. It's weird how people were like "square..no, coffin....NO!" 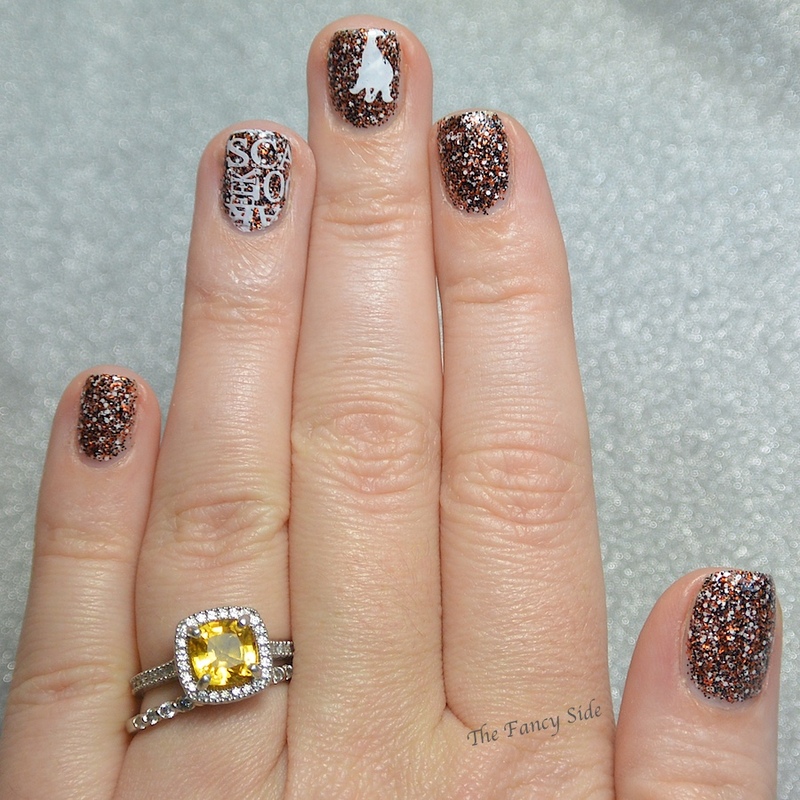 Next I went i with Sinful Colors Snow Me White to create smoke trails following this tutorial. It was surprisingly easy to do. For the last touch of my Spooky look, I created a decal with a terrifying ghost from MyOnline Shop JR-22 plate. I wanted it to look like he is coming out of the mists to get you. And there you have it. That's my spooky look. Be sure to see all the other spooky manicures from the other ladies below. 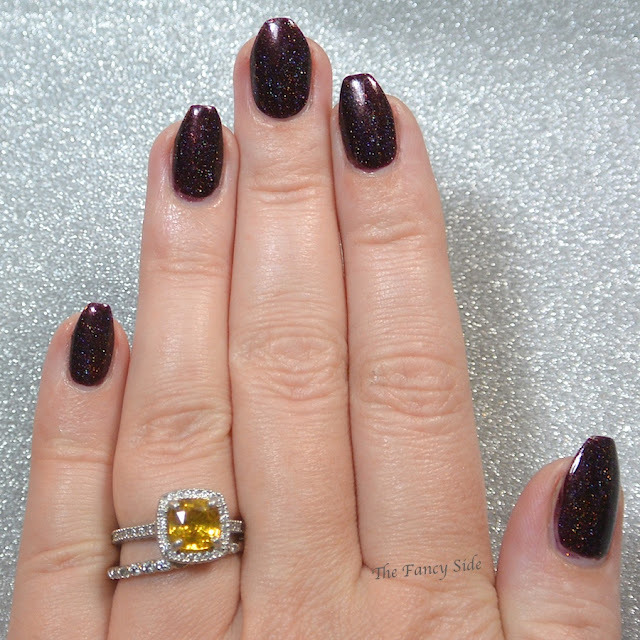 Today, I have a look featuring two beautiful polishes from the new winter OPI Starlight Collection* These beauties were sent via a collaboration with Preen.Me and I'm ecstatic to be included. OPI Give Me Space is by far my favorite of the six polishes I received. 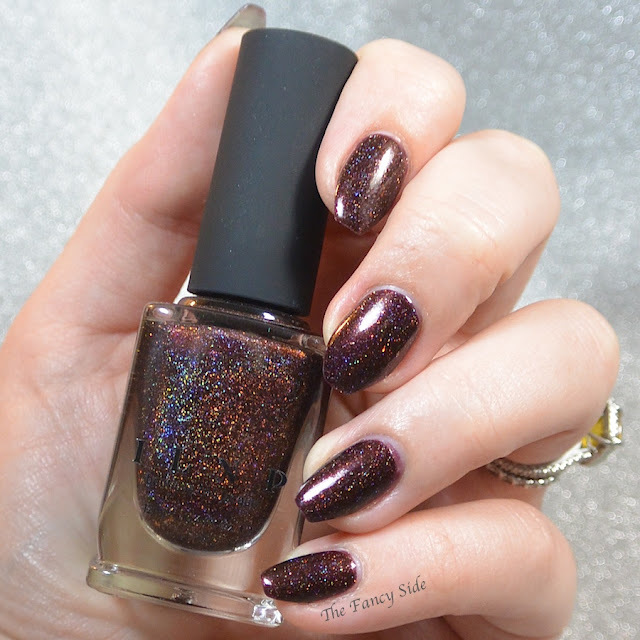 Give Me Space is a deep blue polish filled with enough sparkles and flash to look like the night sky. 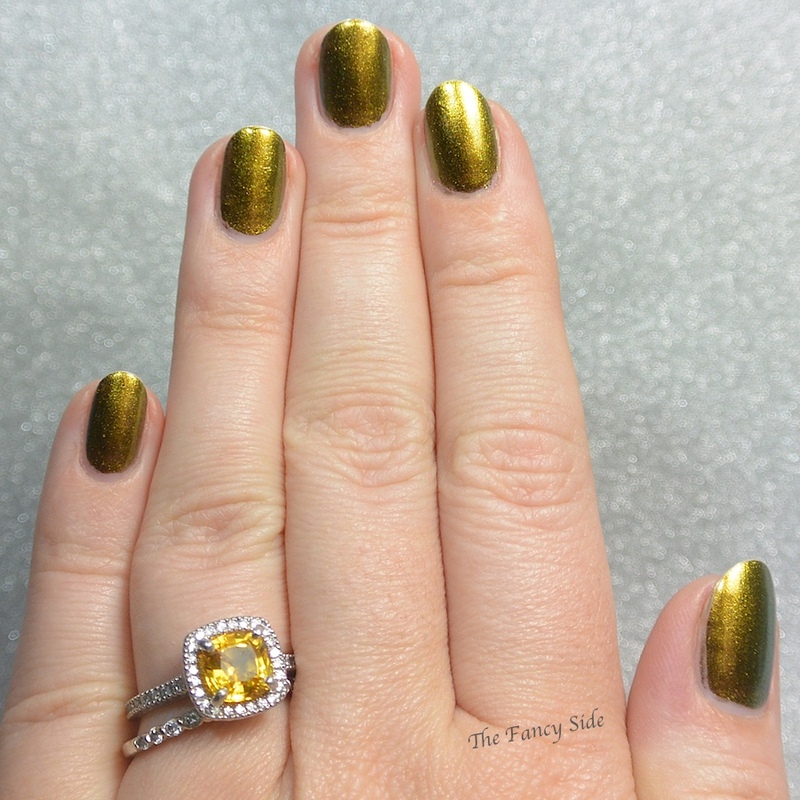 This is the perfect base for galaxy nails! My swatch is two perfect coats, no application issues. 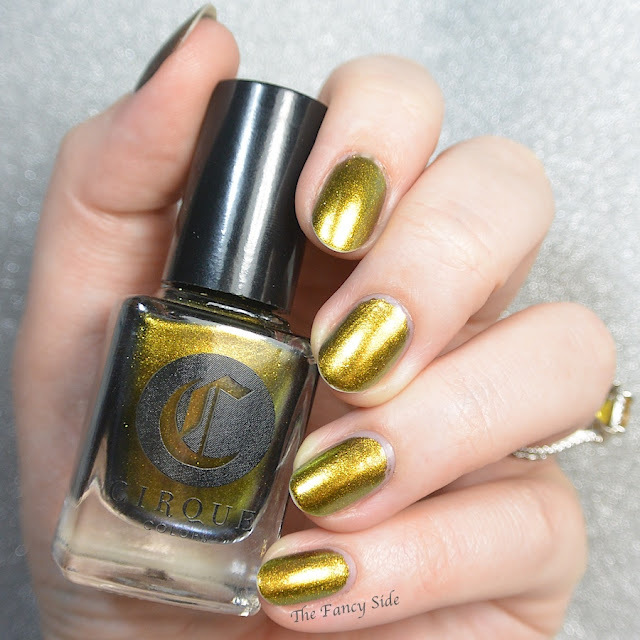 This next shade is a glitter topper and I've heard people all over the internet basically say "WHAT IS THIS DOING IN THIS COLLECTION?" The thing is, I totally get the vision, it looks like space junk in a bottle. 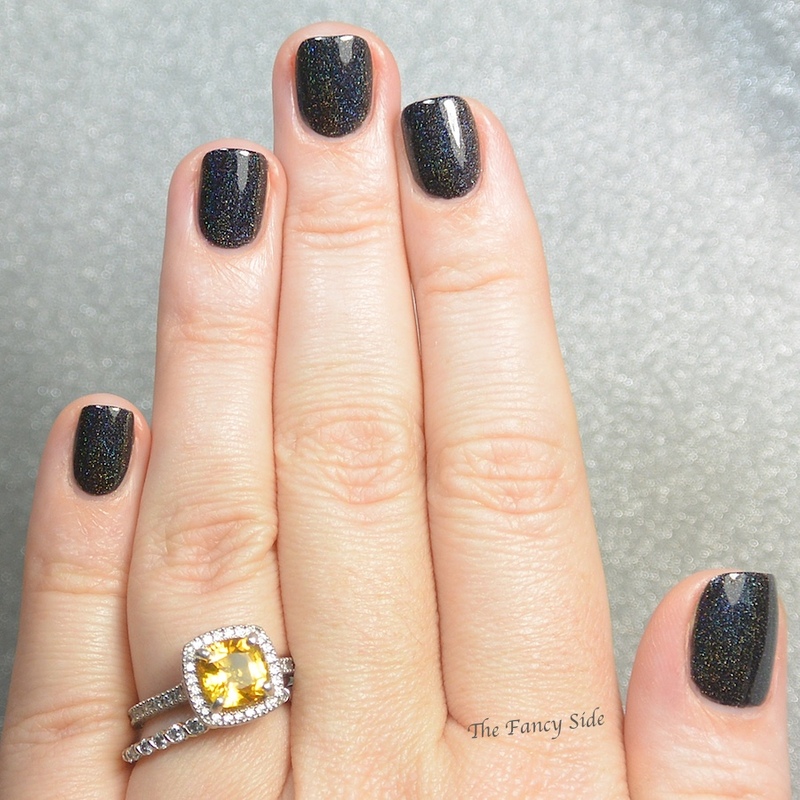 OPI Two Wrongs Don't Make a Meteorite is filled with dark gray diamonds, tiny pink hexes, and off balance chevrons in a clear base. I pulled the chevrons out and created a tribal-esque accent nail, I love how that pale pink matches up with the blue base. There you have it. 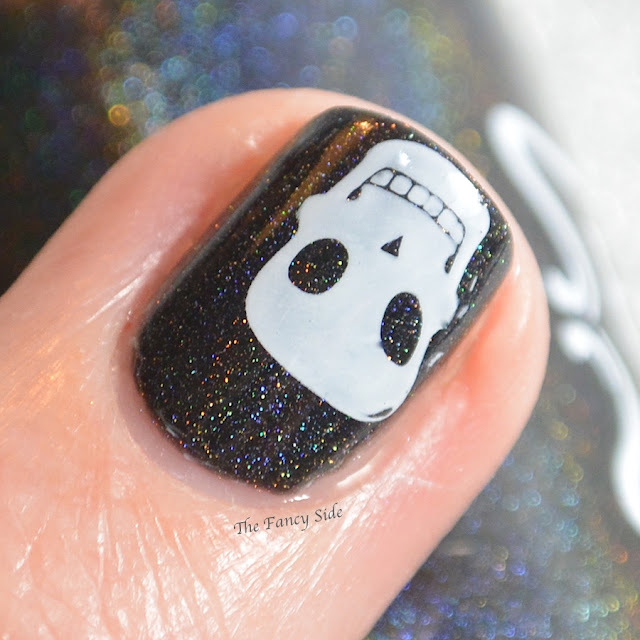 An incredibly simple look but with great pop! Happy Saturday ya'll!!!! Anyone have super fun weekend plans? We went to see a concert last night and now we're just lazing about the apartment. Today I have a fun beauty to show you. This is Serum No 5 You're So Boo-tiful. This is a black jelly filled with purple, fuchsia, green, orange, and silver glitters. Bonus...it glows bright blue in the dark. I used two normal coats for full coverage here. Then inspired by the lovely Lo of Bruised Up Dolly I stamped on some spiders and webs from Uber Chic Halloween-01 in Sinful Colors Snow Me White. I then added on some flat backed pearls to give the spiders some dimension. I'm normally not a creepy crawly person, but damn, I love those spiders. So there you have it! 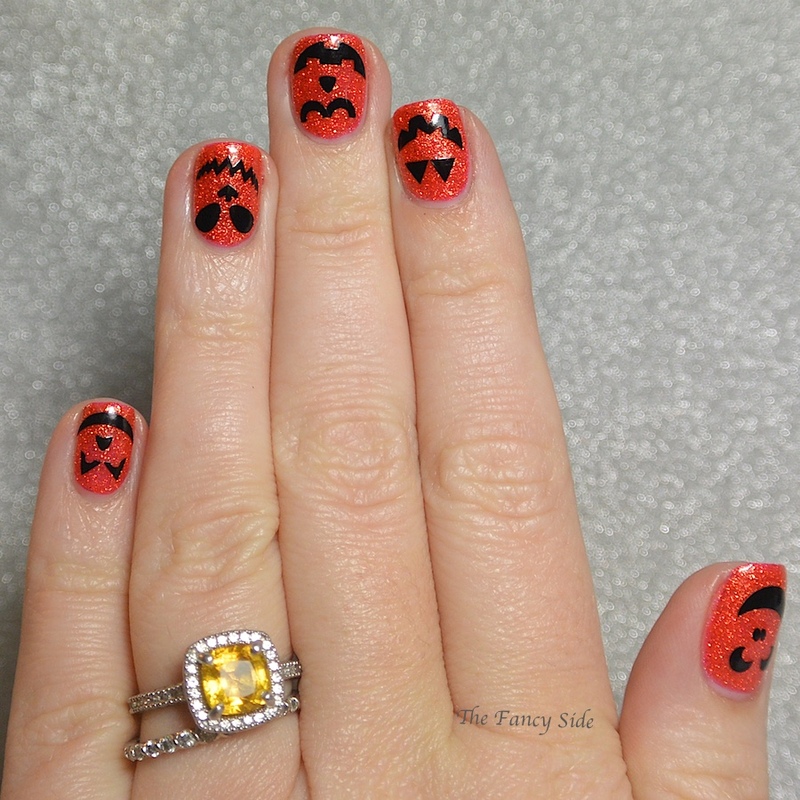 Only one more week of fun Halloween manis ahead. Do you want to see anything specific? 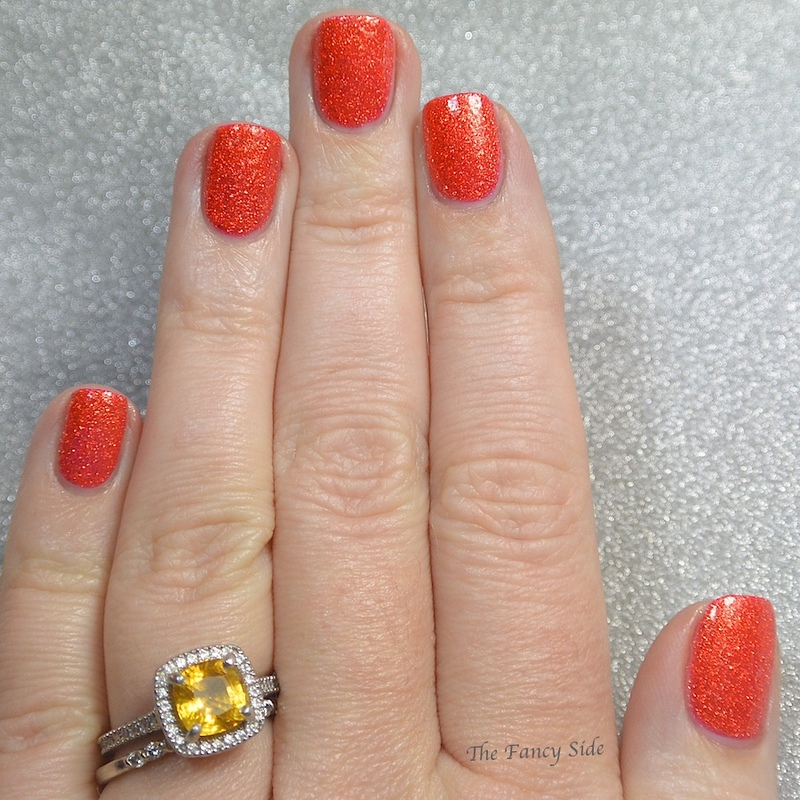 Another fun swatch for you today. When Annie texted me and said she'd figured out how to make brush stroke free multichromes, I knew immediately that they would be mine. As soon as they hit my doorstep, I had to play with them but deciding on the first one to use was incredibly hard. I finally settled on Cirque Colors Some Great Reward. This beauty shifts from green to gold, and sometimes I feel like there is a flash of blue there on the far edges as well. 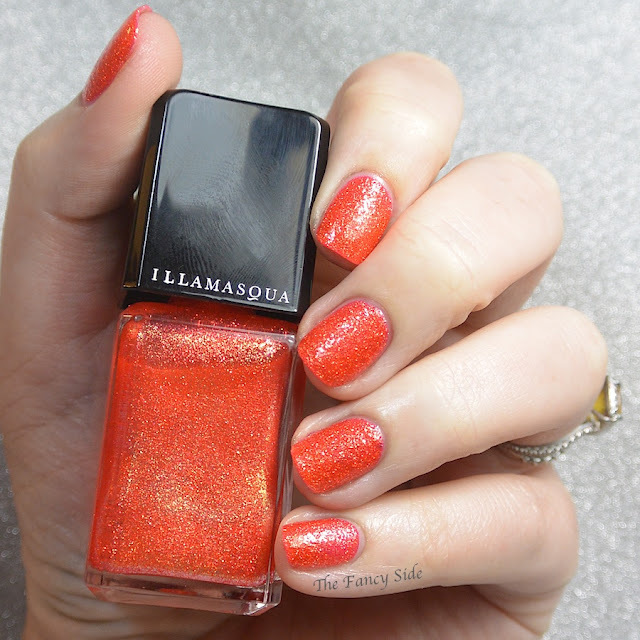 Today I have a quick swatch for you all. I was having bloggers block today, I have so many backed up looks photographed that I couldn't decide which one to post. I let the girls vote and they chose Pahlish White Moon. 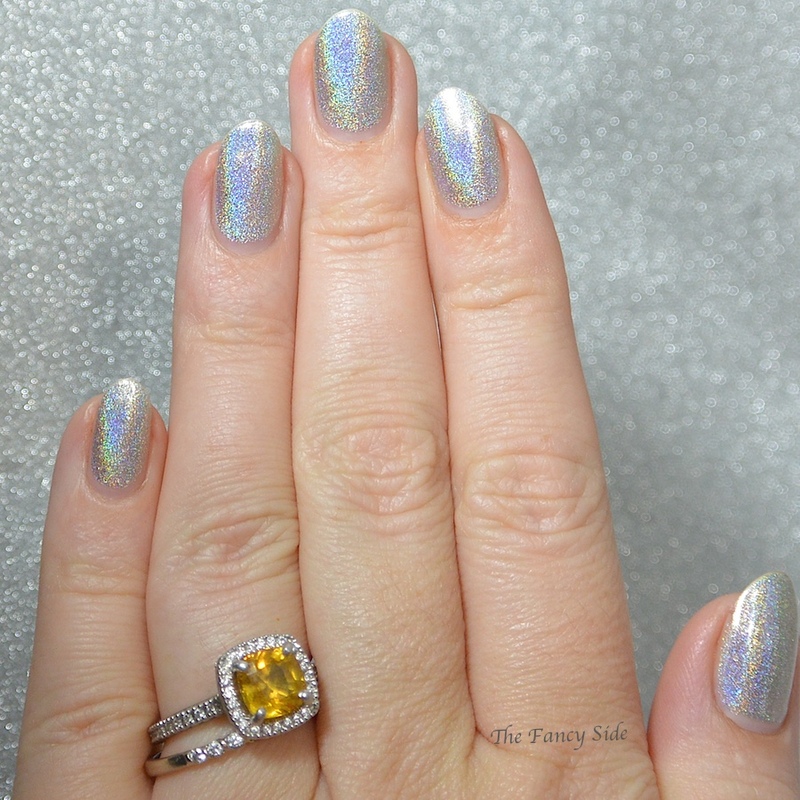 This is a beautiful silver holo that was easy to apply and opaque in 2 easy coats. 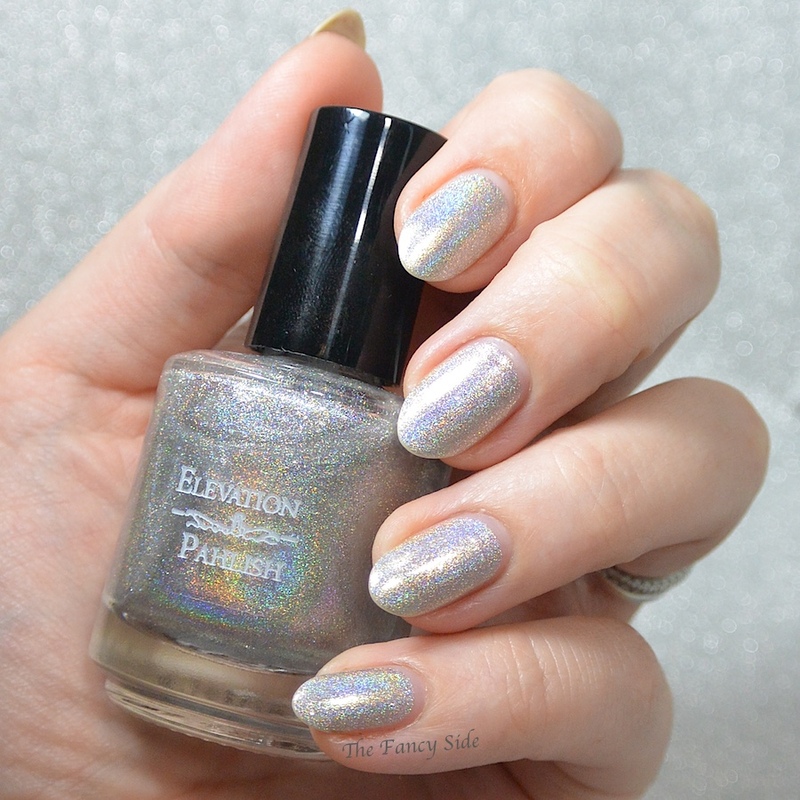 Of all the silver holos I have this one is so light that it is totally deserving of the name. Look at that rainbow flame! I'm so in love with this beauty, I wore her to a wedding weekend, it was the perfect complement to every outfit I wore. Happy Saturday y'all! I'm writing this post today while watching my beloved boys in blue, the Royals, play in the postseason. If this were an audio recording, you'd be hearing normal talk interspersed with yelling. To say I'm into Postseason Baseball is an understatement, especially when my boys are playing. 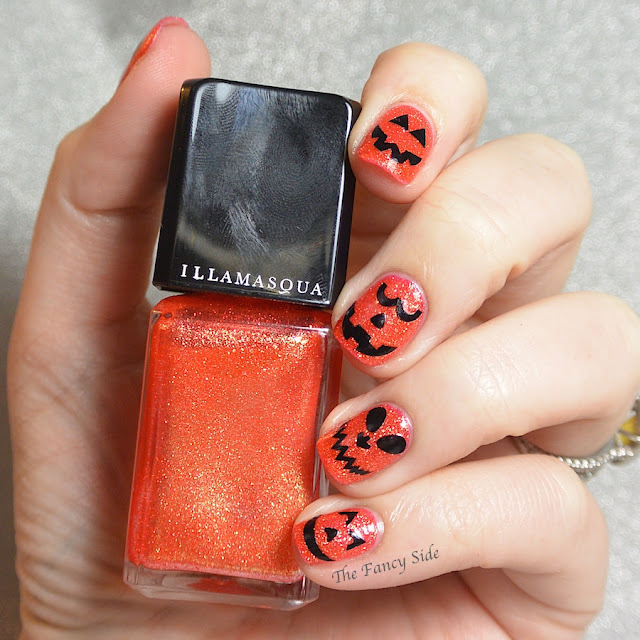 Today I have another fun Halloween look to show you. I think I've established where I stand on the whole October/Halloween issue, so prepare yourself for even more themed looks. 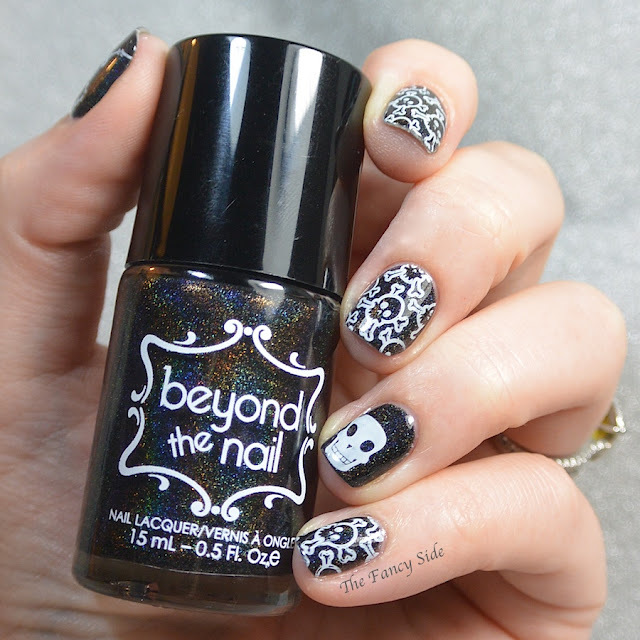 Today I started with a base of Beyond the Nail Black Hole*. This was two easy coats for full coverage and lots of rainbows in that holographic base. 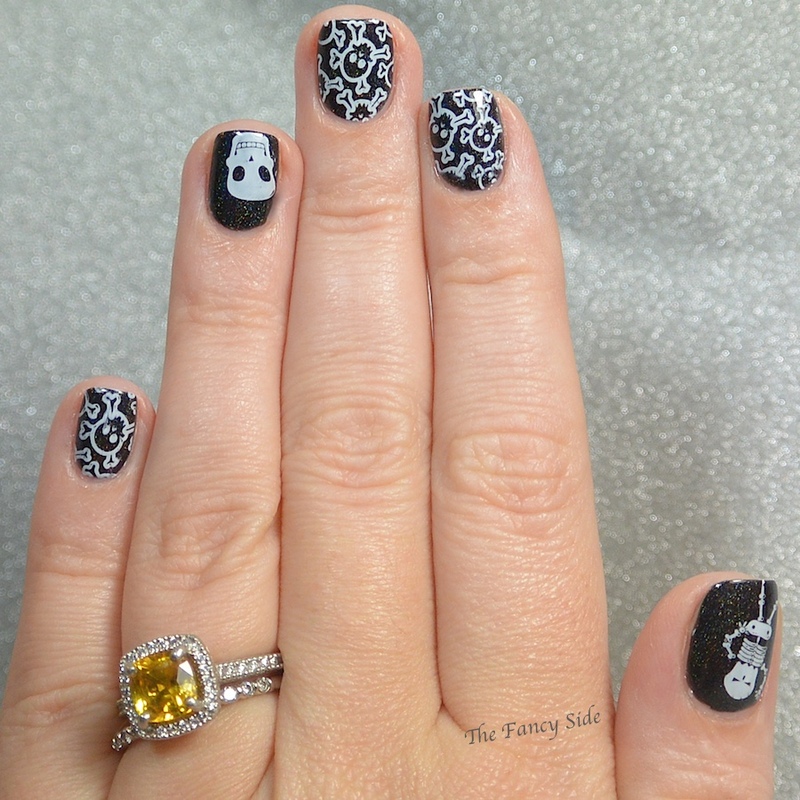 I then went in with Uber Chic Halloween-01 and Sinful Colors Snow Me White to add in all kinds of skeletons. My favorite is the little guy hanging out on my thumb. 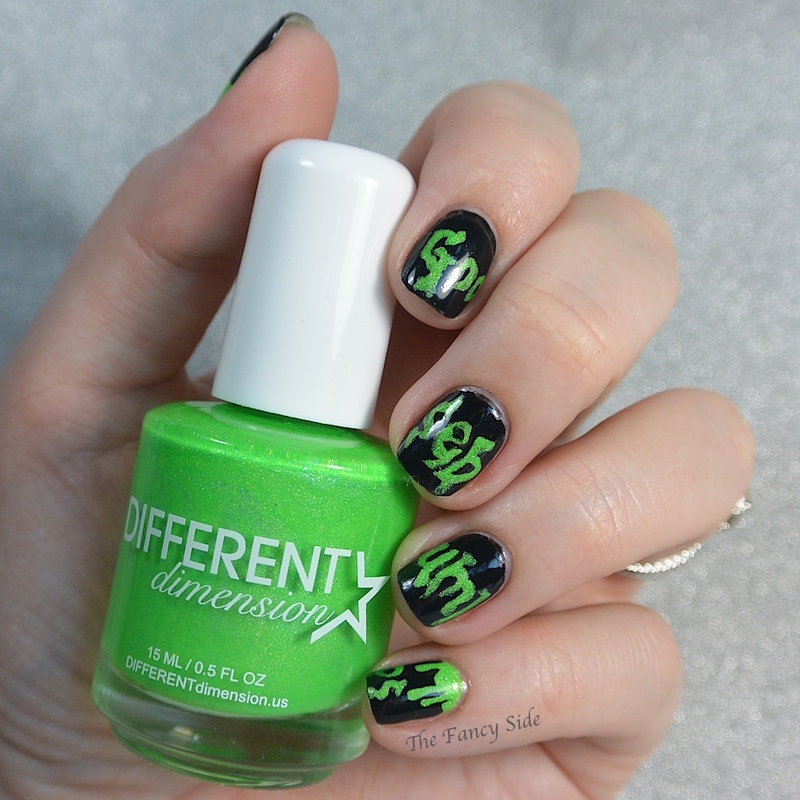 Be sure to check out other #StampingSaturday looks below or join us!